5 Group classes for $99!!! Bargain!!! 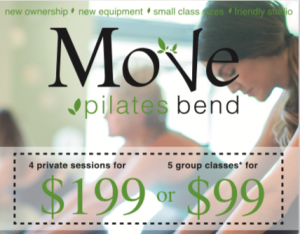 Move Pilates is a beautiful Pilates Studio in Bend, Oregon instructing Pilates classes and private sessions that are the finest mind-body pilates classes in Bend Oregon’s community. At Move, we offer personalized fitness sessions led by our qualified and friendly instructors and a flexible schedule to best accommodate our clients needs. Our instructor-client ratio stays small to ensure each client has focused attention and detailed instruction to keep them safe and challenged. Our goal is to keep you active and strong for the rest of your life!